President Barack Obama and rock star Bruce Springsteen stand arm-in-arm at Madison, Wisconsin campaign rally on November 5, 2012. Photo, Nikki Kahn/Washington Post. One of the more interesting images from the 2012 presidential election campaign came on November 5th, 2012, the day before the election, when President Barack Obama was campaigning in Madison, Wisconsin. On election day November 6th, The Washington Post ran a front page photo from that event of the President standing arm-in-arm with rock legend Bruce Springsteen as he waved to the crowd. Other newspapers and news wires also used this photograph or similar ones of the same Obama-Springsteen appearance. The photo captures a political moment, certainly, but it also underscores how important celebrity endorsements and celebrity imagery have become in elections of all kinds – even though political analysts have said time and time again, that celebrities have only a marginal effect on persuading voters to go with one candidate or another. Front page of November 6th, 2012 edition of Washington Post newspaper using the Obama-Springsteen photo. There may also be something of a first in the Washington Post putting this image on its front page. How many times has a sitting president appeared in a campaign photo arm-and-arm with a celebrity that ran on the front page of a national newspaper – or on the cover of a major news magazine? Presumably, that’s pretty rare – especially on election day. But perhaps that’s a moot question in these times since presidents and presidential candidates appear frequently with celebrities in many public venues. And yes, politicians have been courting the rich, famous, and otherwise influential since forever. Politicians in ancient Rome no doubt sought out famous gladiators and popular generals to do their bidding. More recently, in 20th century American politics, Franklin D. Roosevelt sought Frank Sinatra’s help in the 1940s – as did John F. Kennedy in 1960. On television, Richard Nixon appeared on Jack Parr’s late night TV talk show in 1963, and also in one memorable 1968 Laugh-In TV spot. The December 2007 endorsement of U.S. Senator Barack Obama for president by TV celebrity Oprah Winfrey (yellow jacket) made front page news across the country. In the 1980s, Ronald and Nancy Reagan stood arm-in-arm with R&B legend Ray Charles in a prime-time TV moment during the 1984 Republican National Convention. Bill Clinton played saxophone on The Arsenio Hall Show in June 1992, an appearance some say helped Clinton win new supporters. And in December 2007, Barack Obama received the endorsement of Oprah Winfrey in a much publicized moment during the Democratic presidential primary – also captured on a number of newspaper front pages. Today of course, politicians appear regularly on TV shows such as the Late Show with David Letterman, The Tonight Show with Jay Leno, The View, The Daily Show with Jon Stewart, and others. And with the web and You Tube, images of politicians and celebrities are now quite ubiquitous. It is also noted that in recent years even papers like the Washington Post have included more coverage of celebrities in politics, with regular sections devoted to celebrity doings on all manner of public policy, consequential or not. Yet there is still something indelible and lasting about photographs of the Springsteen-Obama variety displayed on the front pages of major newspapers. Clearly, the decisions by major news organizations to use such images in prominent display are not minor matters, or made without purpose. In this specific case, no doubt, the choice of photo and its placement likely had something to do with the type of Midwest working-class voters that pundits were saying Obama absolutely needed to win re-election – and Bruce Springsteen’s appeal to those very same voters. But beyond these questions of news organization photo choices and the play now given celebrities in politics, the Obama-Springsteen alliance is interesting in its own right, and has a history that now stretches over several years. Some of that history follows below. Bruce Springsteen performing at an Obama campaign rally in Cleveland, Ohio, 2008. Bruce Springsteen has been in Barack Obama’s corner since at least April 2008 when he first endorsed then U.S. Senator Barack Obama for the Democratic presidential nomination. Obama at the time was battling Hillary Clinton for his party’s presidential nomination. Springsteen, who first became a rock sensation in the mid-1970s, has been sought out by politicians for years who have tried to associate with his music, gain his endorsement, and/or use his name in a speech, as Ronald Reagan did when he was campaigning for reelection in New Jersey in September 1984. Nov. 2, 2008: Bruce Springsteen with then presidential candidate Sen. Barack Obama at rally in Cleveland, Ohio. AP photo/Alex Brandon. During the 2008 campaign, Springsteen appeared at several Obama rallies, and also performed several solo acoustic performances in support of Obama. Near the end of the 2008 campaign, on November 2nd, he debuted the song “Working on a Dream” in a duet with his wife, Patti Scialfa. On the night of Obama’s electoral victory, November 4, 2008, Springsteen’s song “The Rising” was the first song played at the Chicago Grant Park rally after Obama’s victory speech. Bruce Springsteen performing "The Rising" with an all-female choir at President Obama’s inauguration, 2009. January 18, 2009: Scene around the Lincoln Memorial in Washington, D.C. during inaugural concert & festivities. Bruce Springsteen was also the opening musical act for the Obama Inaugural Celebration at the Lincoln Memorial in Washington, D.C. on January 18, 2009 – an event attended by more than 400,000 people. At that celebration, Springsteen performed “The Rising” with an all-female choir and also sang Woody Guthrie’s “This Land Is Your Land” with Pete Seeger. Springsteen and Seeger were not the only performers that day, as a number of others performed then and through the evening with the various inaugural balls. A long list of Hollywood stars and musical artists came to Washington as invited performers, readers, and special guests to fete Obama on his special day. A partial list of some of those involved in the inaugural festivities include the following: Jack Black, Mary J. Blige, Jon Bon Jovi, Garth Brooks, Steve Carrell, Sheryl Crow, Rosario Dawson, Renee Fleming, Jamie Foxx, Josh Groban, Herbie Hancock, Tom Hanks, Heather Headley, Ashley Judd, Martin Luther King III, Beyonce Knowles, Queen Latifah, Bettye Lavette, John Legend, Laura Linney, George Lopez, Jennifer Nettles, John Mellencamp, Kal Penn, Shakira, James Taylor, Marisa Tomei, Usher, U2, Denzel Washington, Forest Whitaker, will.i.am, Stevie Wonder, Tiger Woods, and others. Actor Robert De Niro looks on as President Obama congratulates Bruce Springsteen as a Kennedy Center Honoree during a December 2009 White House ceremony. …Finally, we honor the quiet kid from Jersey — (laughter) — who grew up to become the rock ‘n’ roll laureate of a generation. For in the life of our country only a handful of people have tapped the full power of music to tell the real American story — with honesty; from the heart; and one of those people is Bruce Springsteen. He has said: “I’ve always believed that people listen to your music not to find out about you, but to find out about themselves.” And for more than three decades, in his songs — of dreams and despair, of struggle and hope — hardworking folks have seen themselves. It’s no wonder that his tours are not so much concerts, but communions. There’s a place for everybody -— the sense that no matter who you are or what you do, everyone deserves their shot at the American Dream; everybody deserves a little bit of dignity; everybody deserves to be heard. At the Kennedy Center ceremony, Springsteen was also lauded by several celebrities including Jon Stewart, with musical tributes from John Mellencamp, Ben Harper, Jennifer Nettles, Melissa Etheridge, Eddie Vedder, and Sting. Meanwhile, back in Springsteen’s home state of New Jersey, some developments on the Republican side of the political aisle during 2009 would also involve the singer and his music. 2009: New Jersey’s Chris Christie. In November 2009, Chris Christie – an up-and-coming Republican star in New Jersey’s political ranks who had been a top fundraiser for George W. Bush’s 2000 presidential campaign, and later, New Jersey’s U.S. attorney – was elected governor. He had defeated former Democratic governor and U.S. Senator Jon Corzine. Christie was also a devoted Bruce Springsteen fan who had attended more than 120 of Springsteen’s concerts. Christie regarded Springsteen’s politics as a form of populism that anyone could identify with, though he parts ways with Springsteen on some of his core philosophy, such as his view that “nobody wins unless everybody wins.” Christie holds “that in life there are winners and losers — there just are… We can’t make everybody winners. But you can make more people winners.” Christie says he doesn’t take Sprinsteen’s politics personally. For him, with Springsteen, it’s the music that matters. After his election, Christie wanted nothing more than to have Springsteen appear at his inauguration, scheduled for January 2010. Through an intermediary, Christie sent word to Springsteen’s manager, Jon Landau, to ask if Springsteen would perform. Christie offered to make a gift to Springsteen’s charity of choice if he would agree to perform for the governor-elect.In late 2009, New Jersey governor Chris Christie wanted Springsteen to perform at his inaugural festivities. Knowing that Springsteen was a Democrat, Christie’s people also offered to put a little distance between the Christie inauguration and any Springsteen event, suggesting a benefit concert in the week leading up to the January 19th inaugural. The editors of The Star Ledger newspaper of Newark, New Jersey, the state’s largest circulation newspaper, even ran an editorial on November 7th urging Springsteen to do the concert, saying the state needed “a Kumbaya moment.” But word came back that Springsteen did not want to get involved in state politics. Springsteen’s rejection was reportedly polite – that he was quite aware that Christie was a fan, and as a loyal citizen of New Jersey, wished him every success as governor. Christie’s people then arranged for the B Street Band, a Springsteen tribute band, to perform at the governor-elect’s inaugural party. But there would be more to come with Christie and Springsteen later. Christie, in any case, became more of a national figure as he began to be touted as a possible Republican Presidential candidate. Cover art for Bruce Springsteen single, "We Take Care of Our Own." Musically, meanwhile, Springsteen had been working on a new album that would bear the title, Wrecking Ball, his 17th studio album; an album that included a compilation of songs that were a reaction to, and indictment of, Wall Street’s financial crisis and the effect it has had on the nation and people’s lives. Wrecking Ball wouldn’t be released until March 2012, but one of its songs was released early – “We Take Care of Our Own” – which made its live debut on February 12, 2012 at the 54th Grammy Awards. On February 9th, 2012, a few days before the song’s airing at the Grammy Awards, Obama’s reelection team released a playlist of five songs the campaign would be using at campaign rallies. Among the songs was Springsteen’s “We Take Care of Our Own.” Others on the list included: “I Got You” by Wilco; “Roll With The Changes” by REO Speedwagon; “You’ve Got The Love” by Florence & The Machine; and, “Let’s Stay Together” by Al Green. However, the Springsteen tune became a popular and often used song during the Obama campaign – as its main refrain – “we take care of our own” – was generally a good fit with what the Obama Administration was trying to do with its economic recovery programs; trying to lift the nation out of its hard times. At the Democratic National Convention in early September 2012, the song also received some prime-time exposure when it was played immediately following Barack Obama’s speech on September 6th. While Obama’s speech may not have been the highlight of the convention, the airing of the Springsteen song at that time helped boost the music. According to Billboard, sales for “We Take Care Of Our Own” jumped more 400 percent during the weekend that ended September 9, 2012, following Obama’s speech. And by late September, after Mitt Romney’s remarks at a private fundraiser were made public about how “47 percent” of the electorate were victims and that he wouldn’t have to worry about them if elected President, the Springsteen song, “We Take Care of Our Own,” took on even more resonance at the Obama rallies. But Springsteen himself had repeated his intent to stay out of the race, making remarks to The New Yorker in July 2012, saying that he wasn’t sure whether he’d get involved again: “I did it twice [once for Kerry in 2004 and Obama in 2008] because things were so dire… It seemed like if I was ever going to spend whatever small political capital I had, that was the moment to do so. But that capital diminishes the more often you do it. While I’m not saying never, and I still like to support the President, you know, it’s something I didn’t do for a long time, and I don’t have plans to be out there every time.” But as the race tightened in late September and early October, especially following Obama’s faltering in the first debate, Springsteen once again became a more visible Obama supporter. Ticket to Bill Clinton-Bruce Sprinsteen rally for Obama in Parma, Ohio. Bill Clinton greeting Bruce Springsteen on stage at Parma, Ohio Obama rally. On October 17, 2012, Springsteen took to his website to explain his support for the President. “A message from Bruce” noted in part: “Right now, there is a fight going on to help make this a fairer and more equitable nation. For me, President Obama is our best choice to get us and keep us moving in the right direction…” In the message, Springsteen also voiced support for “sterling candidates” Sen. Sherrod Brown (D-Ohio) and Elizabeth Warren, the Massachusetts Democrat seeking a U.S. Senate seat. On the following day, October 18th, 2012, Springsteen joined former president Bill Clinton at an Obama campaign rally in Parma, Ohio, near Cleveland. A crowd of 3,000 fill a gymnasium at Cuyahoga Community College, with 700 more in an overflow area. Bruce Springsteen performing with acoustic guitar at Obama rally in Parma, Ohio. Springsteen performed a set of four songs in Parma, and on the same day, he also appeared at another Obama event in Ames, Iowa. After that, there were more appearances by Springsteen at Obama events in Virginia, Pittsburgh and Wisconsin. On Saturday afternoon, October 27th in Pittsburgh, for example, he performed for Obama before a capacity crowd at the Soldiers and Sailors Memorial Hall and Military Museum. In late October, however, as Hurricane Sandy began its destructive trek up the East Coast, the presidential campaign was temporarily overshadowed. But this event, too, figured into the Obama-Springsteen interplay and national politics. President Barack Obama hugs marina owner Donna Vanzant as he tours hurricane-damaged Brigantine, N.J., with Gov. Chris Christie, Oct. 31, 2012. Photo, Larry Downing /Reuters. On the evening of October 29th, 2012, Hurricane Sandy made landfall at Atlantic City in southern New Jersey, and soon ravaged the NewYork-New Jersey area with severe flooding and extensive damage to coastal areas. The hurricane occurred in the final weeks of the presidential election campaign, putting both the Obama and Romney campaigns into a temporary lull. But the catastrophe brought President Obama to the storm-damaged New York-New Jersey area, raising his national leader visibility as full state and national emergency efforts were launched to deal with the devastation. The President came to the hard hit areas, and joined with New York Governor Cuomo, New York Mayor Michael Bloomberg, and New Jersey Governor Chris Christie to commit government help to the devastated communities. New Jersey Governor Chris Christie had praise for the president during the crisis – a sore point with the Republicans and the president’s opponent, Gov. Mitt Romney. “It’s really important to have the President of the United States acknowledge all the suffering that’s going on here in New Jersey and I appreciate it very much,” Christie said during Obama’s October 31st visit to the Brigantine Beach Community Center in Brigantine, N.J., north of Atlantic City. Christie and the President stayed in contact by phone in the days following the disaster. Meanwhile, Bruce Springsteen, a New Jersey native who came to fame in Asbury Park, also became involved in Sandy relief effort. He was doing his scheduled concert appearances during this time as well, and on October 31, 2012, two days following the storm, he dedicated his performance at a concert in Rochester, New York to those affected by the storm and those helping with the recovery effort. At another concert at Penn State University on November 1st, he gave a shout out to Governor Christie for his hurricane work. On Friday November 2nd, 2012, Springsteen and Jon Bon Jovi, also a New Jersey native, joined Sting, Christina Aguilera and other music stars for an NBC-organized televised benefit concert to raise funds for victims of Sandy. The show, titled “Hurricane Sandy: Coming Together” was organized by NBC as a commercial-free one- hour benefit. In addition to Bon Jovi, Sting, Springsteen and Agulera were other performers and celebrities, including: Billy Joel, Jimmy Fallon, Steven Tyler, Mary J. Blige, Tina Fey, Jon Stewart, Whoopi Goldberg, Danny DeVito and NBC News’ Brian Williams. Today show co-anchor Matt Lauer was the host. During the show, Springsteen joined Billy Joel, Steven Tyler and Jimmy Fallon for a performance of “Under the Boardwalk.” Springsteen and the E Street Band closed the show on a message of hope with a rousing rendition of their tune “Land of Hope and Dreams.” The telethon raised some $32 million. All money was donated to the American Red Cross. Gov. Christie & Bruce Springsteen back- stage at NBC's Hurricane Sandy telethon. Backstage at this event, Springsteen had a moment with one of his biggest fans, Governor Chris Christie, where according to Christie, “we hugged and he told me, ‘it’s official, we’re friends’.” A quick photo of this meeting, capturing a handshake between the two backstage, was taken by Al Roker of NBC, shown at left. Poster for final campaign event in Des Moines, Iowa for Nov 5, 2012 with the President, Michelle Obama & Bruce Springsteen. As the presidential race resumed in early November, the Obama campaign announced that Springsteen would be making more appearances at Obama rallies in Wisconsin, Ohio, and Iowa on November 5th, 2012, the day before the election. Springsteen then appeared on that day at three rallies for Obama – one in Madison, Wisconsin; one in Columbus, Ohio with Jay-Z; and a final appearance in Des Moines, Iowa with the president and Michelle Obama. On that day, November 5th, the first of three stops was Madison, Wisconsin, the state capital, and home to the University of Wisconsin. The rally took place in the streets near the capitol building. Some 18,000 supporters had gathered there in the cold as early as 6:30 a.m., four hours before Obama would arrive. President Barack Obama greeting Bruce Springsteen at Madison, WI campaign rally. On the way to the next rally, in Columbus, Ohio, Springsteen sat with Obama aboard Air Force One as the two discussed the Hurricane Sandy recovery effort then underway in New Jersey. That’s when the President was also speaking on the phone with Governor Chris Christie, and when he brought Springsteen on the line to chat briefly with the governor. President Barack Obama on stage at Columbus, Ohio rally Nov. 5, 2012, flanked by Jay-Z and Bruce Springsteen. Jay-Z on the cover of the Forbes 400 "rich list" issue for 2010, along with Warren Buffett. Jay-Z, whose real name is Shawn Carter, grew up in Brooklyn and had earlier struggles with crime, but went on become a very successful recording artist, music producer and wealthy businessman, marrying pop star Beyoncé Knowles and recently becoming a father. Obama also told the crowd that Jay-Z and Springsteen were examples of “what our country is about” – two guys who rose from humble beginnings to go on to fame and fortune. Jay-Z, President Obama & Bruce Sprinsteen have one last wave to the crowd in Columbus, Ohio. For Obama, the Columbus rally marked his 29th political appearance in Ohio for 2012. The president had also done a number of taped radio interviews that day, dropped in for a visit at his Columbus campaign office, and appeared on ESPN during halftime of “Monday Night Football” that evening, as did Mitt Romney. A few hours later that same day, also in Columbus, Romney and his wife Ann appeared before an enthusiastic crowd in a large airport hangar at Port Columbus. At that rally, the Marshall Tucker Band helped stir the crowd for Romney and he also had two well-known Ohio athletes speak there before he took the podium – ice skater Scott Hamilton and pro golfer Jack Nicklaus. Back at the Obama rally at the Nationwide Arena, President Obama, after he gave his speech, brought Springsteen and Jay-Z back up to the stage (along with the prior speakers as well) for one last wave to crowd — this as a recorded version of “We Take Care of Our Own” played in the background. Then it was on to Iowa. Bruce Springsteen escorted first lady Michelle Obama to the stage in Des Moines, 5 Nov `12. He closed out his 25-minute mix of songs and commentary with “Land of Hope and Dreams,” finishing just before 10 p.m., when he introduced First Lady Michelle Obama to the crowd. Mrs. Obama thanked the “great state of Iowa” for launching the Obama bid to “change the country four years ago” and not long thereafter, introduced her husband. Michelle & Barack Obama wave to the crowd in Des Moines, Iowa, Nov. 5, 2012. President Obama underscored the fact that it was in Des Moines where his campaign in 2008 really got its start. He reminisced with the crowd about how his improbable bid back in the winter of 2008, with its upset victory over Hilary Clinton and John Edwards in the Iowa Democratic primary, sent him on his way. Beyond the nostalgia, Iowa was also a key state in the President’s Midwestern campaign strategy. Victories in Iowa, Wisconsin and Ohio would put the president over the required 270 electoral votes needed for reelection. Obama was up by about five points in the state according to most of the Iowa polls, but his campaign was taking nothing for granted. The Des Moines Register had endorsed him in 2008, but this time the leading Iowa newspaper had sided with Mitt Romney. After the Iowa stop, the Obama campaign moved on to Chicago where, among other things, the President was scheduled to have a bit of exercise in a traditional election-day pick-up basketball game. November 6, 2012: Election day edition of the “State Journal” newspaper in Madison, WI showing President Obama greeting Bruce Springsteen at rally a day earlier. On election day, voter turnout was heavy in a number of states, with polling places extending hours in some cases as long lines had formed. The ongoing tabulation of results remained close well into the night, with special attention focused on some seven key swing states, Ohio chief among them. Sometime after 11:15 pm Eastern Time, various news organizations called Ohio and Iowa for President Obama, and not long thereafter, at about 11:30 pm, they began calling the presidential election for Obama. The final election results revealed that Obama took 50.96 percent of the popular vote with 65,464,068 votes, while Mitt Romney had 47.31 percent with 60,781,275 votes. The electoral talley was 332 for Obama and 206 for Romney. …Indeed, in the final days, with Bruce riding around with Obama on Air Force One, it was almost as though he was on the ticket, Obama’s spiritual VP. Or at least ambassador from Asbury Park…. And the concerts and especially that song [“We Take Care of Our Own”] —the guy knows how to go straight for the heart, like a laser-guided drone. He knows how to make you feel, for at least an instant, we could all be better than we are. That’s a talent. But Bruce Springsteen was certainly not alone among high-profile celebrities who helped Obama in his reelection bid. While Springsteen was performing with Obama in November, for example, John Mellencamp was doing the same with Vice President Joe Biden and Jill Biden in Virginia. In fact, throughout the 2012 campaign, a number of musicians helped Obama with concerts, rallies, and other support. In April, the Red Hot Chili Peppers gave a private performance for 1,200 campaign staffers in Cleveland; in July, Alicia Keys headlined a rally for women voters in Philadelphia; and in early October, Stevie Wonder, Katy Perry, Jon Bon Jovi and Jennifer Hudson all performed at a campaign event in Los Angeles. Dave Matthews performed at an Obama rally in Bristow, Virginia and also in Aurora, Colorado. In North Carolina, James Taylor undertook an eight-show tour on behalf of Obama, and Pearl Jam’s Eddie Vedder appeared at a $20,000-per-ticket fund-raiser in Tampa, Florida. Actor Morgan Freeman was among five celebrity donors who each contributed one million dollars to support the Obama campaign. Beyond the musicians and high-profile endorsers at campaign rallies there was also the matter of campaign money. Lots of celebrities from Hollywood and the broader entertainment industry gave generously to the Obama campaign and related Political Action Committees (PACs). According to a review of federal election documents by OpenSecrets.org, run by the nonpartisan Center for Responsive Politics, more than 200 celebrities donated a total of some $712,000 to Obama’s re-election bid in the 2012 campaign cycle. Among these donors were, for example: Tom Hanks, Magic Johnson, Ben Stiller, Eva Longoria, Will Smith, Scarlett Johansson, Barbara Streisand, Aaron Sorkin, Steven Spielberg, Gwen Stefani, Quentin Tarantino, Melanie Griffith, Quincy Jones, Cameron Crowe, Don Henley, Ellen DeGeneres, Nancy Sinatra, Jack Black, Jamie Foxx, Randy Newman, Jennifer Garner, Leonardo DiCaprio, Robert Downey Jr., Mariska Hargitay, Jamie Lee Curtis, Marlo Thomas, John Legend, Emmylou Harris, Sam Waterston, and others. Another 90 or so celebrities donated to the Democratic National Committee. Five, including Morgan Freeman and Bill Maher, donated $1 million each to Priorities USA Action, a super PAC supporting Obama. Among Hollywood “bundlers” for Obama – those who pull together multiple donations in one bundle – were Jeffrey Katzenberg of DreamWorks Animation, Obama’s top bundler, pulling together some $2.3 million, and Barry and Wendy Meyer of Warner Brothers, bundling $1.9 million. Music power couple Beyoncé & Jay-Z, shown here at a New Jersey Nets basketball game, hosted a special fundraiser for Obama in New York in Sept 2012. Actor George Clooney hosted a fundraiser at his Los Angeles home in May 2012 that Obama attended which raised over $15 million. In August, the president attended a fundraiser on Long Island, New York hosted by movie mogul Harvey Weinstein, actress Anne Hathaway, Vogue editor Anna Wintour, and filmmaker Aaron Sorkin. Actresses Julianne Moore and Sarah Jessica Parker also hosted separate fundraisers for the president in 2012. In September, Jay-Z and Beyoncé hosted a $40,000-per-seat Manhattan fundraiser for the president at Jay-Z’s 40/40 club. Jay-Z also released a campaign video for Obama in October, and as noted above, campaigned with Bruce Springsteen and the president in Columbus, Ohio. Other celebrities made pro-Obama videos that circulated on the web, including Will Ferrell, Cher, and Kathy Griffin. Morgan Freeman narrated a pro-Obama campaign ad. Still, this is not a full accounting of all the campaign assistance the Obama effort received from actors, musicians, playwrights, professional athletes, and other celebrities. Actor Jon Voight – known for his roles in films such as “Midnight Cowboy” (1969), “Coming Home” (1978), and “Mission Impossible” (1996) – supported Mitt Romney. Romney and the Republicans had their share of celebrities too. Detroit musician Kid Rock performed at Romney rallies and the Romney campaign used Rock’s “Born Free” song as one of its regular campaign anthems for much of 2012. Randy Owen, the lead singer of the group Alabama, and Johnny Van Zant, frontman for Lynyrd Skynyrd, also endorsed Romney, as did country music star Trace Adkins, who performed at campaign rallies for Romney. John Elway, former quarterback for the Denver Broncos, endorsed Romney in Colorado a few days before the first debate. Donnie and Marie Osmond were Romney supporters, as was Gene Simmons of the rock group Kiss. Actors Jon Voight, Kelsey Grammar, Robert Duvall, Check Norris and Jeff Foxworthy endorsed Romney too, as did Clint Eastwood, famously, at the Republican National Convention. Obama out-raised Romney by nearly 5-to-1 among donors from the “TV/ movies/music” segment. Cindy Crawford appeared in a video on behalf of Romney, and comedian Dennis Miller and former pro golfer Jack Nicklaus also endorsed the Republican candidate. But in terms of celebrity campaign donations, Romney had a relatively small share of the Hollywood/ music industry money pot, receiving some $46,500 from donors including: playwright Neil Simon, Olympic figure skater Kristi Yamaguchi, actor Orson Bean, producer Jerry Bruckheimer, professional football player Peyton Manning, and World Wrestling Entertainment CEO Vince McMahon and his wife, Linda, a Republican candidate herself, then running for the U.S. Senate seat in Connecticut being vacated by retiring Sen. Joe Lieberman. The McMahons were also among those donating to Restore Our Future, a conservative super PAC backing Romney’s bid. And the Republican National Committee picked up $78,886 from celebrity donors who included the McMahons, Jerry Bruckheimer, singer Pat Boone, New York Yankee baseball star, Alex Rodriguez, and others. But over the 2010-2012 election cycle, according to one count, Obama out-raised Romney by nearly a 5-to-1 margin among donors from the “TV/ movies/music” segment, receiving roughly $4.5 million in donations from that group compared to something under $1 million for the Romney campaign. November 6, 2012 election-day edition of the Wilmington, Delaware “News Journal” newspaper, also ran the Obama-Springsteen photo on its front page. But Bruce Springsteen, because of his following in the swing-state and rust-belt Midwest – and also among working-class voters broadly – appears to have played a more-than-normal celebrity role in the final weeks of the 2012 election. And perhaps for that reason alone, his front-page notice in the Washington Post and a few other newspapers on election day was right on target. But Springsteen has also shown himself to be one of the more thoughtful celebrities when he does become involved in political campaigning, not entering the fray lightly. In 2004, when he decided to take up the cause for John Kerry, he wrote an Op-Ed piece in the New York Times explaining his views on the candidate. And he has also used his website to post longer statements explaining his political views and the backing of particular candidates. But for most of his fans– Democrat, Republican, or Independent – his message is already transparent in his music, which normally conveys a determined, though sometimes angry but usually hopeful, American patriotism. Of his ride on Air Force One with President Obama in Nov 2012, Bruce Springsteen rated the experience as “pretty cool” – here with wife, Patti Scialfa. Bruce Springsteen sharing a joke with audience at Des Moines, Iowa rally about late-night Obama phone calls. Bruce Springsteen greeting First Lady Michelle Obama at campaign rally in Des Moines, Iowa, Nov. 5, 2012. Bruce Springsteen and other Kennedy Center honorees being lauded by President Obama & First Lady Michelle Obama in President’s box, Kennedy Center, Washington, D.C., December 2009. October 2004: Presidential candidate John Kerry with Bruce Springsteen at campaign rally in Madison, Wisconsin. Photo, Mike DeVries /Capital Times. October 2008: Portion of invitation to Billy Joel/Bruce Springsteen special concert & Obama fundraiser hosted by Harvey Weinstein, Anna Wintour & others. Stevie Wonder with President Obama at the White House. Wonder performed at Obama campaign rallies in 2008 & 2012 and at the president’s 2009 inauguration. Nov 2012: Poster advertising Obama rally with former President Bill Clinton and musician Dave Matthews. Katy Perry performing at October 2012 Obama rally in Las Vegas wearing her latex “election ballot” dress – with the Obama-Biden box filled in. John Mellencamp performed at Obama and Vice President Joe Biden campaign rallies in 2008 and 2012. Notice posted on the internet about Jay-Z performing at Obama campaign rally in Columbus, OH, 5 Nov 2012. Rapper and music mogul Jay-Z performing at Obama campaign rally in Columbus, Ohio, 5 November 2012. On-line notice about Bruce Springsteen appearance for Obama in Madison, WI, November 5, 2012. Associated Press, “Springsteen Endorses Obama for President,”USA Today, April 16, 2008. John Soeder, “Springsteen Plays New ‘Working on a Dream’ Tune at Obama Rally in Cleveland,” The Plain Dealer (Cleveland, Ohio), November 2, 2008. Eliot Van Buskirk, “Recording Artists’ Eleventh-Hour Campaigns – Mostly for Obama,” Wired.com, November 3, 2008. Jennifer Roche, “Inauguration Opening Celebration 2009 -‘We Are One’,” About .com. Steve Hendrix and Jonathan Mummolo, “Jamming on the Mall for Obama,” Washington Post, January 18, 2009. Office of the Press Secretary, The White House, “Remarks by the President at Reception for Kennedy Center Honorees,” East Room, The White House, December 6, 2009. “Kennedy Center Honors: Obama On Bruce Springsteen, 2009,” YouTube.com. David M. Halbfinger, “In New Jersey, Would-Be Boss Is Big Boss Fan,” New York Times, September 29, 2009. David M. Halbfinger, “He Ain’t There on Business, Baby, He’s Only There for Fun,” New York Times, September 29, 2009. Editorial, “Bruce Springsteen, Bring New Jersey Together and Play Gov.-elect Chris Christie’s Inauguration,” The Star-Ledger (Newark, NJ), Saturday, November 7, 2009. David M. Halbfinger, “Christie’s 123rd Bruce Springsteen Concert Won’t Be at His Inauguration,” New York Times, December 9, 2009. Stephen C. Webster, “Springsteen Drops Video for Obama 2012 Song: ‘We Take Care of Our Own’, RawStory.com, Friday, February 10, 2012. Gloria Goodale, “As Election 2012 Nears, Hollywood Republicans Are Braving the Limelight,” CSMonitor.com, February 29, 2012. Amy Bingham, “Celebrity Endorsers: Stars Align Behind Presidential Hopefuls,” ABC News, March 4, 2012. Joyce Jones, “Jay-Z and Beyoncé to Host Obama Fundraiser; Tickets Cost $40,000 a Pop to Attend the New York City Event,” BET.com, September 12, 2012. “Bruce Springsteen & Barack Obama: Boss Gets DNC Bump For ‘We Take Care Of Our Own’,” HuffingtonPost.com, September 13, 2012. David Corn, “Secret Video: Romney Tells Millionaire Donors What He Really Thinks of Obama Voters,” MotherJones.com, Monday, September 17, 2012. Matt Donnelly, “Obama Thanks Jay-Z, Praises Beyonce at Exclusive NYC Fundraiser,” Los Angeles Times, September 19, 2012. Ben Yakas,”We Take Care Of Our Own: Bruce Springsteen To Campaign For Obama,” Gothamist.com, October 13, 2012. “Bruce Springsteen To Campaign for Obama in Ohio,” NBCNews.com, October 13, 2012. David Nakamura, “In Ohio, Bill Clinton and Bruce Springsteen Will Lend a Hand to Obama / After a Rocky Month, Campaign Looks To Tap an Infusion of Star Power,” Washington Post, Sunday October 14, 2012, p. A-11. “Jay-Z Stumps for Obama in New Campaign Clip; President Embodies the ‘Hope of All the People Across the Country’,” Rolling Stone, October 15, 2012. Steve Knopper, “Rockers Rally to Obama in Campaign’s Final Days; Why Bruce Springsteen, Jay-Z and Other Stars Are Stumping for the President,” Rolling Stone, October 17, 2012. Bruce Springsteen, “A Message From Bruce,” BruceSpringsteen.net, October 17, 2012. Helene Cooper, “Springsteen Helps Obama Lure Blue-Collar Votes in Ohio,” New York Times, October 18, 2012. Associated Press, “Springsteen Explains Why He’s Supporting Obama,” Salon.com, Thursday, October 18, 2012. Jim Rutenberg, The Caucus, “Springsteen Makes It Official: He’s for Obama,” New York Times, October 18, 2012. Rosalind S. Helderman, “Bruce Springsteen, Bill Clinton Campaign for Obama at Ohio Rally,” Washington Post, October 18, 2012. Chris Cillizza, “Bruce Springsteen, Barack Obama and the Fix Endorsement Hierarchy,” Washington Post, October 18, 2012. Madeline Boardman, “Bruce Springsteen Imitates Obama And Improvises A Campaign Song At Virginia Rally,” HuffingtonPost .com, October 24, 2012. “Bruce Springsteen Dedicates Song to Jersey Storm Victims at Penn State Gig; Rocker Sings ‘My City of Ruins’ for Asbury Park, Praises First Responders,” Rolling Stone, November 2, 2012. Reuters & NBC Staff, “Stars Perform to Help Victims of Sandy,” NBCNews.com, Nov. 2, 2012. James Sullivan, “Springsteen Leads Stars in Sandy Benefit,”Rolling Stone, November 3, 2012. “‘The Boss’ Joins the President in Wisconsin” Chicago Tribune (video), November 5, 2012. Michael Leland, “The President and The Boss in Wisconsin,” Wisconsin Public Radio, November 5, 2012. John Nichols, “Today Comes the Referendum: Will We ‘Take Care of Our Own’?” The Nation.com, November 5, 2012. Rachel Weiner, “Springsteen and Obama Discussed Sandy on Flight,” Washington Post, November 5, 2012. David Sarasohn, “Barack Obama’s Presidential Power — Mobilizing The Boss…” The Oregonian, November 6, 2012. David Nakamura and Rachel Weiner, “The Boss Sings His Support,” Election 2012, Washington Post, November 6, 2012, p. A-4. David Nakamura, “A Nostalgic Obama Returns to Iowa for The End of His Last Campaign,” Washington Post, November 6, 2012, p. A-7. Associated Press, “Now ‘Friends,’ Christie & Springsteen Hug; NJ’s Governor Meets NJ’s Favorite Son as Both Pledge to Help Repair the Garden State,” NBC Philadelphia.com, Tuesday, November 6, 2012. “Springsteen and Christie Are Total BFFs Now, Thanks to Sandy,” MSN.com, Nov. 6, 2012. “Newspaper Front Pages Have One Message On Election Day,”HuffingtonPost.com, Nov. 6, 2012. Ron Rosenbaum, “How Bruce Springsteen Elected Barack Obama,” Slate.com, Friday, November 9, 2012. “Wrecking Ball” (Bruce Springsteen album), Wikipedia.org. Bruce Springsteen (Op-Ed),”Chords for Change” New York Times, August 5, 2004. “Newspaper Articles,” The Bruce Spring- steen Special Collection, Monmouth University, West Long Branch, New Jersey. Cavan Sieczkowski, “Republican Hollywood: Celebrities Who May Vote For Mitt Romney In November Election,”HuffingtonPost .com, September 5, 2012. “Bruce’s Speech From Madison, WI,” Bruce Springsteen.net, November 5, 2012. Matt Orel, “Bruce Joins President Obama and Jay Z in Ohio,” BruceSpringsteen.net, November 5, 2012. Tom Nettleton, “Bruce Joins President & Mrs. Obama in Iowa,” BruceSpringsteen.net, November 5, 2012. Joe Hallett and Joe Vardon, “Candidates Give Celebrity-Studded Farewells to Columbus,” The Columbus Dispatch (Columbus, Ohio), Monday, November 5, 2012. Deirdre Shesgreen, “Obama Columbus Rally: ‘Inspirational’,” Cincinnati.com, November 5, 2012. Helene Cooper, “Campaign Diary: Candidates Spending Final Day in Swing States,” New York Times, November 5, 2012. Brent Johnson, “Bruce Springsteen Joins Obama on Final Campaign Day,” The Star-Ledger, November 5, 2012. Ali Weinberg, “Obama, Springsteen Wrap Up Wisconsin Campaign,” NBCNews.com, November 5, 2012. Jim Kuhnhenn, Associated Press, “Obama Lines Up Stevie Wonder, Lady Gaga, Billie Jean King, Jay-Z & More In Campaign’s Final Days,” HuffingtonPost.com, November 5, 2012. Zack O’Malley Greenburg, “Jay-Z, Barack Obama, Mitt Romney And The Politics Of Music,” Forbes.com, November 5, 2012. “Bruce Springsteen For Obama: ‘Let’s Go To Work’ – In an Eloquent Speech, He Says the Election Decides the Difference Between the American Dream and American Reality,” Salon.com, Tuesday, November 6, 2012. Helene Cooper, “A Bit of Quiet Optimism, and Some Superstition, Before a Tight Victory,” New York Times, November 6, 2012. David Dolmage, “President and Michelle Obama, Bruce Springsteen Rally Iowa Voters One Last Time” (photos), West Des Moines Patch, November 6, 2012. Associated Press, “AP Calls the Presidential Race – State by State,” AP.org, November 7, 2012. Adam Nagourney and Jim Rutenberg, “Obama’s New Courting of Hollywood Pays Off,” New York Times, May 9, 2012. Mackenzie Weinger, “Hollywood Stars Open Wallets for Obama,” Politico.com, July 12, 2011. Anna M. Tinsley, “Stars Shine Again in 2012 Campaigns,” Star-Telegram.com (Ft. Worth, Texas), Monday, October 1, 2012. Michael Janofsky, Reuters, “Hollywood Votes with its Wallet: Obama Holds 16-1 Advantage in Fund-Raising,” Chicago Tribune.com, October 27, 2012. “List of Barack Obama Presidential Campaign Endorsements, 2012” (entertainment group), Wikipedia.org. “Contributions from Celebrities – 2012 Presidential,” OpenSecrets.org, accessed, December 8, 2012. President Ronald Reagan speaking at the Reagan-Bush campaign rally in Hammonton, NJ, 19 September 1984. It was mid-September 1984. U.S. President Ronald Reagan was on the campaign trail bidding for reelection in a race against Democrat and former vice president, Walter Mondale. Reagan was leading in the national polls at the time and had come to Hammonton, New Jersey for a Reagan-Bush campaign rally to give a campaign speech. Hammonton, known for its blueberry production, is located in southeastern New Jersey in Atlantic County, not far from Atlantic City. The town had gone all out for Reagan’s visit, staged in an outdoor venue. Patriotic bunting decorated the buildings and a local band with cheerleaders was in place on the stage. A giant American flag filled a large wall behind where Reagan would speak. And a large printed banner running along that wall offered a patriotic slogan that read: “America: Prouder, Stronger & Better.” A crowd of more than 30,000 had come out in Hammonton to hear Reagan, many of them waving hand-held American flags. Ronald Reagan, barely visible in this photo, center left, approaching rostrum for 1984 speech at Hammonton, NJ, September 19th. Photo, PerOwer, flicker.com. Ronald Reagan typically had optimistic and upbeat things to say in his speeches, and his remarks in Hammonton that day were no exception. This time, however, in part of his speech, he made reference to a popular rock and roll singer known to many in New Jersey and elsewhere. Bruce Springsteen at the time was about as popular as a rock ‘n roll singer could be, and it certainly wouldn’t hurt a politician – even an incumbent president – to be identified with that popularity. Springsteen then had a very successful album, Born in the U.S.A., with a popular song of the same name. The album had been released in June 1984 and was No.1 on the Billboard album chart by July 1984, remaining on the chart for 139 weeks. It would also spawn seven Top-10 hit singles and become one of the best-selling albums of Springsteen’s career with over 15 million copies sold in the U.S. alone. It was a monster hit, as was its title song, “Born in the U.S.A.” The release of the song as a single had followed the album. It was the third single from the album, and peaked at No.9 later that year on the Billboard Hot 100 singles chart. Cover of Bruce Springsteen’s 1984 single, “Born in The U.S.A.,” which rose into Billboard’s Top Ten. Click for digital single. Washington Post columnist, George Will, took Bruce Springsteen’s rock music the wrong way. (see his full column at end). President Reagan’s 1984 reelection campaign, then a few months before the national elections, was in full stride. George Will, a conservative Republican, had some friends and connections in the Reagan White House. Will got the idea that bringing Springsteen, or his songs, and the Reagan-Bush campaign into closer alignment might not be a bad idea, and he suggested this to some of his White House friends, including Michael Deaver, Reagan’s long-time advisor. Deaver staffers then made inquiries to Springsteen’s people, asked if the song could be used for the campaign. They were politely rebuffed. Still, the idea that Reagan should somehow try to associate with the popular Springsteen did not die, and seems to have reached Reagan’s speechwriters, which accounted for Reagan’s remarks about Springsteen in his September 1984 speech at Hammonton. The national campaign press, meanwhile, after hearing Reagan’s mention of Springsteen at Hammonton, were skeptical that Reagan knew anything at all about Springsteen or his music. Some asked what Reagan’s favorite Springsteen song was, for example. After a time, came the answer: “Born to Run.” Late night talk show host Johnny Carson began making jokes about Reagan’s new favorite music. Bruce Springsteen performing in 1985. Springsteen himself was on tour as the George Will piece ran in the papers, and also when Reagan gave his speech in Hammonton. But a few days after Reagan’s speech, during a September 22, 1984 concert in Pittsburgh, Springsteen responded. He was on stage introducing his song, “Johnny 99,” a song about an unemployed auto worker who turns to murder. “The President was mentioning my name the other day,” said Springsteen, as he moved into his song, “and I kinda got to wondering what his favorite album musta been. I don’t think it was the Nebraska album [about hard times in America]. I don’t think he’s been listening to this one” [“Johnny 99”]. Meanwhile, Democratic presidential challenger Walter Mondale would say sometime later while campaigning, “Bruce Springsteen may have been born to run but he wasn’t born yesterday,” referring to Reagan’s use of the Springsteen association. Mondale later claimed to have been endorsed by Springsteen. But Mondale, too, was off the mark. Springsteen manager, Jon Landau, denied any such endorsement, and the Mondale campaign issued a retraction. Cover of Bruce Springsteen’s “Born in the U.S.A.” album – No.1 on the Billboard chart in July 1984. Click for CD or digital. George Will and Reagan’s speechwriters had misinterpreted Springsteen’s music. True, they may have mistook the energy of the song and its rousing chorus for a kind of pro-America flag-waving, when actually the message was about how the system beat people down, and in the case of “Born in the U.S.A,” a local guy who goes off to fight in Vietnam, and returns to find no job, no hope, no respect. It’s the working class disconnected from government and certainly from foreign policy. At the time of George Will’s column, some who had read his thoughts on Springsteen’s music took exception to his interpretation, charging that he was trying to refashion Springsteen as a “hero of the right.” Yet there are strains of patriotic craving in the song. Some social scientists have scored “Born in the U.S.A.” as a lamentation on the loss of true national pride and a critique of a hollow patriotism – a cry for a patriotism that was once there but no longer exists. Sept 1984: President Ronald Reagan acknowledging the crowd at Hammonton, New Jersey. AP photo. Ronald Reagan, in any case, was re-elected in 1984, as the Reagan-Bush ticket soundly beat Walter Mondale and running mate Geraldine Ferraro. The American economy continued to limp along for a few more years with unemployment in the 7-to-7.5 percent range. Springsteen, meanwhile, was in the midst of one his most popular periods, having continued success in performing and songwriting. Ronald Reagan, however, would not be the only politician to try to associate with Springsteen’s music. In 1996, U.S. Senator Bob Dole, then running for president against Bill Clinton, briefly used “Born in The U.S.A.” in his campaign a few times until Springsteen objected. And in the year 2000, Republican Pat Buchanan, also mounting a campaign for president, used “Born in the USA” as intro music to open his campaign. For other stories at this website on music and politics, see for example: “I’m A Dole Man,” “I Won’t Back Down,” and “Baracuda Politics.” Thanks for visiting — and if you like what you find here, please make a donation to help support the research and writing at this website. Thank you. – Jack Doyle. Iwas born in the U.S.A.
“Born in the U.S.A. (song),” Wikipedia.org. Bernard Goldberg, “Bruce Springsteen,” CBS Evening News, September 12, 1984. George Will, “A Yankee Doodle Springsteen,” Washington Post, September 13, 1984. George F. Will, “Bruce Springsteen’s U.S.A.,” Washington Post, Thursday, September 13, 1984, p. A-19. Ron Collins, “A Curious Piece,” Washington Post, September 17, 1984, p. A-14. Nora Leyland, “Will on Springsteen (Cont’d. ),” Washington Post, September 19, 1984, p. A-26. Francis X. Clines, “President Heaps Praise on Voters in the Northeast,” New York Times, Thursday, September 20, 1984, p. B-20. Francis X. Clines, “Mondale Assails Reagan on Arms,” New York Times, Tuesday, October 2, 1984, p. A-22. Joseph F. Sullivan, “Politics; Rally in Middlesex Lifts Mondale Spirits,”New York Times, Sunday, October 7, 1984, Section 11, p. 1. Robert Palmer, “What Pop Lyrics Say to Us Today,” New York Times, Sunday, February 24, 1985. Jon Pareles, “Bruce Springsteen – Rock’s Popular Populist,” New York Times, August 18, 1985. Nicole Colson, “Sing a Song of Hypocrisy; Do the Political Candidates Pick the Songs That Fit Them?,” SocialistWorker.org, March 28, 2008, Issue 667. Todd Leopold, “Analysis: The Age of Reagan, President Loomed over the ’80s, an Era at Odds with Itself,” CNN.com, June 16, 2004. Jeff Vrabel, “1984 Bruce Springsteen: “Born in The U.S.A,” PopMatters Picks: Say It Loud! 65 Great Protest Songs, Pop Matters.com, July 19, 2007. Bruce Springsteen on the cover of People magazine in September 1984, about the time of President Ronald Reagan’s remarks about him in Hammonton, NJ. Click for copy. Cahal Milmo and Andy McSmith, “Musical Fallout: Pop Goes the Politician…,” The Independent, (UK. ), Friday, May 16, 2008. Jack Sanders, “Springsteen, Walmart, Populism &Republicans,” IssueOriented.com March 19, 2009. Jefferson R. Cowie and Lauren Boehm, “Dead Man’s Town: ‘Born in the U.S.A.,’ Social History, and Working-Class Identity,” American Quarterly – Volume 58, Number 2, June 2006, pp. 353-378. “America’s Future Rests in a Thousand Dreams Inside Your Hearts,” September 19, 1984 speech of President Ronald Reagan at Hammonton, New Jersey, formerly displayed at My Hammonton.com, since removed. Associated Press, “Music and Candidates: An Uneasy Alliance,” KLEW-TV.com, May 29, 2008, updated, November 20, 2008. John Perich, “Born In The USA: Our Most Misappropriated Patriotic Song?,” Over ThinkingIt.com, July 3, 2009. Randall E. Auxier and Doug Anderson (eds. ), Bruce Sprinsteen and Philosophy: Darkness on the Edge of Truth, Open Court Books, 2008. Rob Kirkpatrick, The Words and Music of Bruce Springsteen, Greenwood Publishing Group, 2007,198 pp. “Ronald Reagan Rock,” Hammonton, New Jersey, RoadsideAmerica.com. What I did on my summer vacation: My friend Bruce Springsteen…Okay, he’s only my acquaintance, but my children now think I am a serious person. I met him because his colleague Max Weinberg and Max’s wife Rebecca invited me to enjoy Max’s work, which I did. He plays drums for Springsteen, who plays rock and roll for purists, of whom there are lots. For 10 shows in New Jersey, he recently sold 16,000 $16 tickets in the first hour, all 202,000 in a day. His albums can sell 1 million copies on the first day of release. There is not a smidgen of androgyny in Springsteen, who, rocketing around the stage in a T-shirt and headband, resembles Robert DeNiro in the combat scenes of “The Deerhunter.” This is rock for the United Steelworkers, accompanied by the opening barrage the battle of the Somme. The saintly Rebecca met me with a small pouch of cotton — for my ears, she explained. She thinks I am a poor specimen, I thought. I made it three beats into the first number before packing my ears. I may be the only 43-year-old American so out of the swim that I do not even know what marijuana smoke smells like. Perhaps at the concert I was surrounded by controlled substances. Certainly I was surrounded by orderly young adults earnestly — and correctly — insisting that Springsteen is a wholesome cultural portent. For the uninitiated, the sensory blitzkrieg of a Springsteen concert is stunning. For the initiated, which included most of the 20,000 the night I experienced him, the lyrics, believe it or not, are most important. His songs, and the engaging homilies with which he introduces them, tell listeners to “downsize” their expectations — his phrase, borrowed from the auto industry, naturally. It is music for saying good-bye to Peter Pan: Life is real, life is earnest, life is a lot of work, but . . .
An evening with Springsteen — an evening tends to wash over into the a.m., the concerts lasting four hours — is vivid proof that the work ethic is alive and well. Backstage there hovers the odor of Ben-Gay: Springsteen is an athlete draining himself for every audience. But, then, consider Max Weinberg’s bandaged fingers. The rigors of drumming have led to five tendinitis operations. He soaks his hands in hot water before a concert, in ice afterward, and sleeps with tight gloves on. Yes, of course, the whole E Street Band is making enough money to ease the pain. But they are not charging as much as they could, and the customers are happy. How many American businesses can say that? If all Americans — in labor and management, who make steel or cars or shoes or textiles — made their products with as much energy and confidence as Springsteen and his merry band make music, there would be no need for Congress to be thinking about protectionism. No “domestic content” legislation is needed in the music industry. The British and other invasions have been met and matched. In an age of lackadaisical effort and slipshod products, anyone who does anything — anything legal — conspicuously well and with zest is a national asset. Springsteen’s tour is hard, honest work and evidence of the astonishing vitality of America’s regions and generations. They produce distinctive tones of voice that other regions and generations embrace. There still is nothing quite like being born in the U.S.A.
George F. Will, “Bruce Springsteen’s U.S.A,” Washington Post, Thursday, September 13, 1984, p. A-19. Cover of single for the ‘Streets of Philadelphia.’ Click for digital. In 1993, a very moving piece of music about the plight of AIDS victims was written and performed by rock star Bruce Springsteen for the Hollywood film Philadelphia. The film stars Tom Hanks, who plays dying AIDS victim and young lawyer Andy Beckett who is wrongly fired from his job at a prestigious law firm. In the film, the song is used in the opening credits, played over street scenes of Philadelphia as the story opens with Hanks as rising young lawyer Andy Beckett working at a highly-regarded private law firm. But the power of Springsteen’s song, which fit the movie well, went beyond the film’s airing. For some, the music later helped recall particular movie scenes, and for others, their own experiences with AIDS victims. In its day, the film, and the “Streets of Philadelphia” song, helped provide a much-needed and more sympathetic understanding of AIDS victims and the epidemic. Tom Hanks received an Oscar for his performance in the film, while the Springsteen song won an Oscar, a Golden Globe, and four Grammys. Released in early 1994 as a single, and also on the movie soundtrack, the “Streets of Philadelphia” became a top-of-the-charts hit, peaking at No.9 on the U.S. Billboard Hot 100 and reaching No.1 in several European countries including France, Germany, Ireland and Norway. Along with the soundtrack, sales of the song exceeded one million copies worldwide. There was also a music video made for the song in which Springsteen is featured walking through the streets of Philadelphia with a short appearance by the Tom Hanks character as well. Helping the song’s exposure through 1994 and early 1995 were three Springsteen performances during high-profile, prime-time TV shows: the Hollywood Academy Awards in March 1994; the MTV Music Video Awards in September 1994; and the Grammy Awards in March 1995. Tens of millions saw the song’s performance on those shows. By then, millions had also seen the film and “Streets of Philadelphia” had also racked up various music awards: a Golden Globe for Best Song; an Oscar for Best Song; four Grammy awards (Best Song, Best Rock Song, Best Male Rock Vocal Performance, Best Song Written for a Motion Picture); and finally, an MTV Video Music Award for Best Video from a Film. Critics generally had high praise for the film, some noting the effects of its music. Jonathan Demme, the director (Melvin and Howard, 1980; The Silence of the Lambs, 1991), had a particular strategy in mind regarding the film’s music. Demme wanted people not familiar with AIDS to come to the film, and felt that rock musicians contributing to its score might help bring an audience that would not ordinarily come to film about a gay man dying of AIDS. Demme had first thought about using a song like Neil Young’s “Southern Man” for the film’s opening sequence. But he later decided not to use Young’s music at the opening, and kept looking for other possibilities. However, Young would write and perform another quite moving song used at the film’s ending wake scene and gathering of friends. More on that later. Still needing an opening song, Demme asked Springsteen to do it. Working from his home studio in New Jersey in the summer of 1993, Springsteen produced a piece using lyrics he had previously written about the death of one of his friends. Not quite satisfied with what he came up with, and finding a rough fit with a rock beat, Springsteen nevertheless sent an early, unfinished demo to Demme for a listen. Demme liked what he heard and the piece soon became part of the film. (Trailer for the film follows below for those who may not be familiar with its subject and story line). “Streets of Philadelphia” is perhaps the most memorable tune that came from the film. But Demme also used other music throughout the movie to enhance and imprint its message. 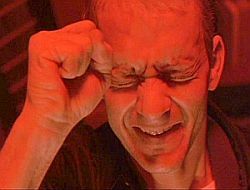 In one quite memorable scene, Hanks’ Beckett character is in the advanced stages of AIDS, but is preparing for his court appearance in a meeting at his home with his attorney, played by Denzel Washington. AIDS victim, Andy Beckett, in the emotional grasp of "La Mama Morta", interpreting its meaning. At the end of the film, too, sometime after the Hanks character has succumbed to AIDS, there is another powerful and moving scene that is amplified by its music. The setting is at a gathering of friends at a private residence paying their respects to Andrew Beckett’s family and friends for their loss, captured by the video clip below. As the camera pans the room of guests, friends are shown arriving and greeting one another, some embracing family members for their loss. After a time of panning around the room showing the guests, the camera then begins to slowly zoom in on a video monitor that is playing a loop of home movies with the Hanks’ character as a child. In the background is the voice of Neil Young, accompanied only by a spare piano. Young sings plaintively in what has been described as his “lost-little-boy” voice. He sings a gentle song with lyrics that cover a lifetime — from childhood and sexual discovery ( “When we were boys and girls / And the secrets came unfurled”), to the grown man’s final fight with AIDS and his community ( “City of brotherly love / Place I call home / Don’t turn your back on me / I don’t want to be alone”). The Young song — titled “Philadelphia” — was also nominated for the Best Song Oscar in the same year with “Streets of Philadelphia,” which took the prize. Demme generally won praise for “book-ending” his film with the two moving, contemporary songs rather than using the more traditional classical scoring. 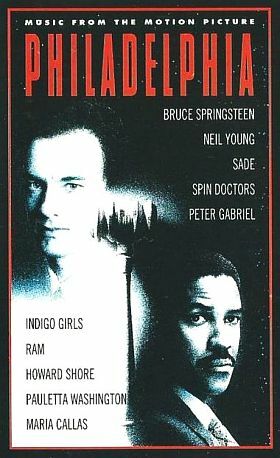 DVD cover for the 1993-94 film, 'Philadelphia,' starring Tom Hanks as an AIDS-afflicted Philadelphia attorney who is wrongfully fired and hires lawyer Denzel Washington to sue his former employer. Click for DVD. In the end, Philadelphia went a long way in helping to increase AIDS awareness while removing some of the disease’s social stigma. The film was one of the first Hollywood productions to make AIDS its primary subject, and is historically important for that reason. Now more than 25 years old, Philadelphia and its music seem to hold up quite well with each passing year. Additional stories on film music at this website include: “The Saddest Song,” a story which tracks the history and impact of Samuel Barber’s “Adagio for Strings” and the powerful use of that music in film scores for Elephant Man (1980), Platoon (1986), and other films; “Philadelphia Morning, 1976-77″, a story about an underrated but highly effective song from Bill Conti’s popular score for the first Rocky film; and Carly Simon’s rousing “Let the River Run,” the theme song for the 1988 film, Working Girl. Other stories at this website exploring the use of music in film include: Mickey & Sylvia’s 1957 song, “Love is Strange” and The Contours’ 1962 song, “Do You Love Me?” (both used in the 1987 film, Dirty Dancing); and the Righteous Brothers’ songs “You’ve Lost That Lovin` Feelin`” used in Top Gun (1986), and “Unchained Melody,” used in Ghost (1990). Tom Hanks in scene from 1993 film, "Philadelphia." Cover of soundtrack from "Philadelphia". Click for CD. Bill Higgins, “‘Philadelphia’ Moves the Masses,” Los Angeles Times, December 16, 1993, p. E-2. Janet Maslin, “Philadelphia; Tom Hanks as AIDS Victim Who Fights the Establishment,” New York Times, Wednesday, December 22, 1993, p. C-15. Steve Hochman, “Touching the Heart of ‘Philadelphia’,” Los Angeles Times, January 2, 1994, p. 60. Stephen Holden, “Eloquent Movies With Eloquent Soundtracks,” New York Times, January 30, 1994. Steve Hochman, “The Boss? Neil Young? Are We in the Right Place?,” Los Angeles Times, March 20, 1994, p. 27. Robert Hilburn, “Springsteen Closes Rock Music Gap: For the First Time in 40 Years of Rock ‘n’ Roll, Hollywood Gives the Best Song Oscar to a Pure Rock Songwriter for ‘Streets of Philadelphia’,” Los Angeles Times, March 22, 1994, p. F-2. Robert Hilburn, “Bruce Springsteen’s ‘Streets of Philadelphia’ Heads Our Critic’s Top 10 List at Midyear,” Los Angeles Times, July 2, 1994, p. F-1. “Streets of Philadelphia” and “Philadelphia,” Wikipedia.org. “Streets Of Philadelphia, by Bruce Spring- steen,” Song Facts.com. Rob Kirkpatrick, The Words and Music of Bruce Springsteen, The Praeger Singer-Songwriter Collection, Westport, Connecticut, 2007, 198 pp. Philadelphia Trailer on You Tube (shown above). Philadelphia Movie Ending on You Tube with Neil Young song “Philadelphia.” (shown above). Neil Young song “Philadelphia”on You Tube separately without ending film sequence. Roger Ebert, Film Review, “Philadelphia,” SunTimes.com, January 14, 1994.